In a life almost always filled with joy, I had a rotten day yesterday. Oh, it can always be worse, but it was one of those days where I really felt like hiding under my bed for the balance of the day. I’ve been thinking about the concept of happiness, joy, fulfillment, and contentment. How we define the concept of happiness depends on our basic view of life. For some, being happy means not being unhappy. We all have trials in our lives,. If we make it to age fifty and we’ve not experienced a personal major loss, illness, or financial crisis, we are awfully lucky. I honestly can’t think of anyone I know who falls into that category — unless they’ve been living in a cave somewhere. Living in a cave comes with its own set of problems. When I look at those in my family who came before me, some of the most happy people were those who struggled the most. I think about loved ones who personal losses exceeded the number of their fingers and toes, yet they found the joy in the simple things of every day life. No one would shove Mame Dennises’ aphorism down the throat of someone who has just lost a spouse or someone receiving difficult chemo treatments for an aggressive cancer. For the rest of us in moments when we are not in terrible crisis, we often choose to make our own crises. I confess — I’ve made drama where there is none. Do you? I’m working on making myself DEAL with and not get upset when the person ahead of me at the UPS Store slows down the line by taking a clearly non-important cell call. Life is too short for me to waste my precious and clearly meaningful lifelong personal anxiety on that woman, or anyone else who doesn’t fit into my schedule or way or doing things. Fixing other people and worrying about what they do is a sure-fire way to dilute the finite commodity of time. After losing my job four years ago, I started writing again after many years of business writing only. Much encouragement came to me from the writers of Open Salon, encouragement in a life-changing way. I’ve always believed that encouragement is a more important currency than money. And you CAN take it with you! My happiness comes from the people I love and those who love me, from seeing beautiful things in nature and on canvas, from listening to all kinds of music and the laughter of others, and from observing and writing about it all. After that watershed moment four years ago, I knew I had to write. I’ve just finished my second book (“A Piece of Her Mind”) and the joy of sharing a laugh with others is absolutely sublime. I am not sure that I will ever know the joy of actually making money from my writing, but that’s another story. Is my secret lowered expectations? Does anyone remember the old MAD TV spoof commercial about the “Lowered Expectations” dating site? “Lowered expectations” may be the secret. Last week my hometown newspaper, a weekly, featured a story on the front page about my new book. The story, complete with my picture and my book cover, took up about a third of the front page. It was lovely and I’m thrilled. Next to the story was another feature story of the week. 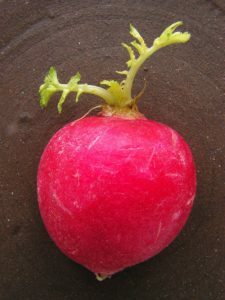 A farmer grew a very large radish, ten inches in diameter. This is my life. I don’t live in Beekman Place, and I’m not writing for “The New Yorker.” a I am happy about getting featured in the “Tribune,” next to a giant radish. While it took me nearly six decades to get to this place, I like it here. And most days I’m very happy. PS If you want to read an excellent article about self-awareness, read Ann Graham Nichols post on elephantjournal.com. Ann provides a great look into Buddhism and I’ve gained much from her writing. You will, also.